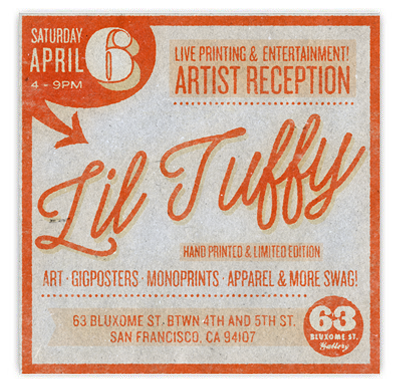 Lil Tuffy is an San Francisco-based artist and designer in the field of modern rock/pop poster art, also known as 'gigposter' art, as well as serigraph and fine art production. As a member of the 2000s resurgence of the poster-art scene he has designed posters for a wide variety of musical acts, including Devo, Slayer, Pavement, Queens of the Stone Age, Faith No More, The White Stripes, The Black Keys, Morrissey and many others. His work has been exhibited in the USA, Canada, Mexico, Spain, Portugal, Germany, France, Belgium, the Netherlands, Serbia, and the UK and he regularly appears at music festivals including South by Southwest, Bonnaroo Music Festival, Noise Pop, Primavera Sound, Outside Lands Music and Arts Festival, Reeperbahn Festival and more. He is a regular contributor to The Fillmore, The Warfield Theatre and the Regency Ballroom's poster series. He serves as board member of the American Poster Institute, a non-profit corporation dedicated to furthering public awareness and appreciation of the poster art form and are the organizers of the a series of rock poster exhibitions called Flatstock. !